Most skin care products contain harmful chemicals added to extend shelf life, thicken consistency, or increase profitability for the manufacturer. Even many creams and lotions made with organic ingredients sneak in added chemicals to extend shelf-life. Some common chemicals used in skin care include formaldehyde, petrochemicals (petroleum and coal-based), phthalates (used to quicken absorption of products into the skin), and paraben, widely used as a preservative. All of these are known carcinogens and are used in deodorant, perfume, cleansers, mascara, moisturizers, and shampoo. My philosophy is that skin care should have a shelf-life just like food. I don’t want my cleanser, moisturizer, deodorant, or perfume to last forever if it requires the inclusion of chemicals. Remember, our skin is able to absorb much of what we put on it and it’s an indisputable fact that some chemicals in beauty products do enter the bloodstream. The good news is that there are an increasing number of products coming to market that are made entirely of healthy ingredients. You may sacrifice some convenience, but you’ll gain a longer life. Now, that’s a trade off I can live with! It’s simple—and very similar to common-sense, real food guidelines. Read the ingredient list, and if you can’t pronounce any items or don’t know what it is, don’t buy it. Major retailers are not likely to carry completely natural products; they need products that have a long shelf-life. You are better off seeking out small producers and retailers who make products with fresh ingredients in small batches. Sounds like the good old days, right? Used for centuries in the Middle East, rose water is a great toner for the skin. 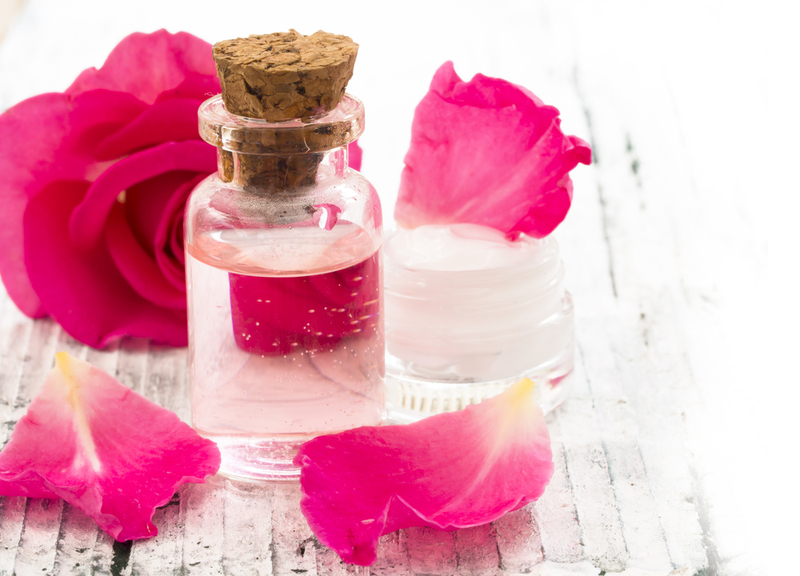 Look for rose water that has at most two ingredients: roses and distilled water. It has anti-inflammatory properties that can help reduce redness, and treat acne, dermatitis, and eczema. Use as a toner after cleansing. NOTE: rose water is also a delicious ingredient in cooking; a drop in tea, chocolate, or cake will add a lovely flavor. Both of these natural oils are magic for the skin. They have much in common, but offer distinct benefits. Combine the two, and you have a powerhouse of beneficial properties. Olive Oil is full of antioxidants and Vitamins A and E. It is a naturally hypoallergenic moisturizer and will not clog pores. Olive Oil helps stimulate cell growth and repairs skin that has been exposed to sun, cigarette smoke, and pollutants. Coconut Oil is used in many natural beauty products because it is antibacterial and antifungal. Thanks to the Medium Chain Fatty Acids (MCFA) found in coconut oil, it absorbs quickly into the skin, leaving it soft and supple. Our skin’s natural sebum also contains MCFA’s, so it’s like our skin recognizes coconut oil as its kin. In fact, both oils contain fats that mimic those native to our skin, allowing them to absorb quickly. Like coconut oil, olive oil improves the elasticity of the skin because it strengthens connective tissue. Both help to heal skin irritation, eczema, psoriasis, bruises, and small cuts and wounds. What’s more, these products are as at home in your pantry as they are on your vanity, offering great flavor and legendary health benefits. Many commercial moisturizers use mineral oil instead of oil or coconut. Mineral oil is a petroleum product, not something we want on our skin or in our blood stream. Combine olive oil and coconut oil in equal parts. Rub into hair, massaging the scalp. Wrap with a towel, leave for 20 minutes, then wash. If you do this once per month, you will have softer more radiant hair. Sugar’s small round granules expertly exfoliate skin, a perfect eco-friendly alternative to recently-banned microbeads. Mix raw natural sugar (cane or coconut) with liquified coconut oil and olive oil (1 tablespoon of each to 1 cup of sugar). Add an essential oil and stir. Use to exfoliate the body in the shower once per week. You’ll find this scrub leaves your skin smooth and without an oily residue. It’s gentle enough to use on your face, too. Mix 2 parts coconut oil, 1 part olive oil, and 2 drops of lavender essential oil. Stir until well-combined. Store at room temperature. Rub into skin morning and night, and you’ll have a new glow in no time. You might be familiar with the old wives tale about drinking apple cider vinegar in the morning. While a bit harsh on the palate, there is evidence that this is a good practice. Apple cider vinegar offers tremendous benefits to our skin too. Look for organic cider vinegar, preferable with evidence of the “mother”—bits of proteins, enzymes and friendly bacteria that makes the liquid look murky in contrast with the clear, pasteurized varieties. Apple cider vinegar, the good organic stuff, is made from apples that go through a double fermentation process. This process releases enzymes and nutrients that are the secret to the health benefits of apple cider vinegar. The apple pectin contained in ACV keeps blood pressure regular and can reduce LDL (bad cholesterol). Combine with extra-virgin olive oil for double impact heart health! The bottom line? 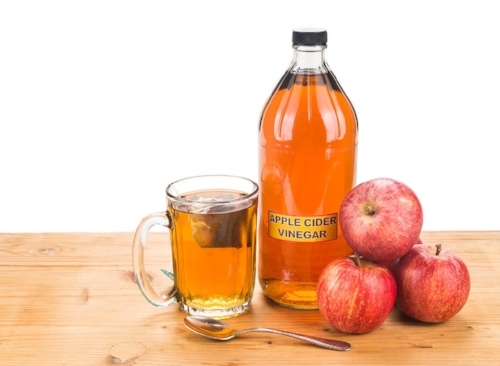 ACV functions as well in the kitchen as in the bath, so buy two bottles! Diluted apple cider vinegar is a good face wash that can help minimize the appearance of fine lines and wrinkles; just soak a cotton pad or cotton cloth in diluted vinegar and dab on your skin. Rinse with warm water and pat dry. Rinse your hair with vinegar after a wash to remove product or oil build up and leave it with a gorgeous shine. Dab on mosquito bites to relieve itching. Rub four parts vinegar and one part water to relieve sunburn and accelerate healing. Notice a pattern here? All of these natural products have a place in your pantry and your vanity. They are truly food for your skin. We offer a carefully curated selection of face and body care products that are made with food grade ingredients that are good is for your skin, your body and the environment. This line, made for us, focuses on high grade fresh extra virgin olive oil as it's base. The body care has a gentle Ginger Tea scent. The face products are unscented. No preservatives are added, so this has a shelf life of 9 months. Coming to our shelves soon, this line from Nashville, TN, focuses on the healing power of organic essential oils. Thistle Farms is a non-profit social enterprise dedicated to empowering survivors of trafficking, prostitution, and addiction. Into ever product goes the belief that love is the most powerful force for change in the world. Their products are rich, natural, and nourishing. I just discovered this line made by Christi in Asheville, NC. She is so knowledgeable and passionate about what we put on our skin and how it impacts our overall health. Using natural food-grade ingredients without fillers, artificial thickeners, or preservatives, she has created an elegant line to nourish our face and body to exude good health. Look for this line in our shelves next month. Let's not forget that part of our health is what we breath. I just discovered Kasey's Lotion Candles made with cosmetic grade soy, grape seed oil, coconut oil, Shea butter, almond oil, vitamin E, rose hip oil and fragrances that are infused with essential oils. Each candle is always handmade within a small batch, ensuring the highest level of quality and consistency. These natural candles will scent your home safely. Blow out the natural cotton wick and dip your finger in the rich nourishing wax to moisturize your hands and body. Cool! PiperWai is the first naturally powerful, aluminum-free deodorant that uses activated charcoal to absorb wetness and fight odor. Natural ingredients like organic coconut oil, shea butter, and pure vitamin E soothe even the most sensitive skin. The stain-free formula rubs in clear and won’t discolor your clothes. This is my new essential. Kjær Weis is an innovative cosmetics line created by Danish-born, New York-based makeup artist Kirsten Kjær Weis. Her cream blush, lip tint and mascara are certified organic, and her eye shadows are certified natural. Organic raw materials are live, non-modified substances so every batch of makeup must be inspected by hand and adjusted to keep the same color and texture, making her products as close as one can get to a handmade piece. Her makeup contains no parabens, silicone, petrochemical emulsifiers,or synthetic fragrances. Blackbird is a fragrance design house specializing in perfumes, incense, bath and cosmetics. The brand is known the world round for its forward-thinking concepts and creations.